Too busy to maintain your site? Did you know that we can…. We can get your new website up and running in no time. Call today and find out how. We offer several different Monthly Website Maintenance Plans. Whether you’re an up and coming home business or a full fledged e-commerce online company, we have the plan for you. 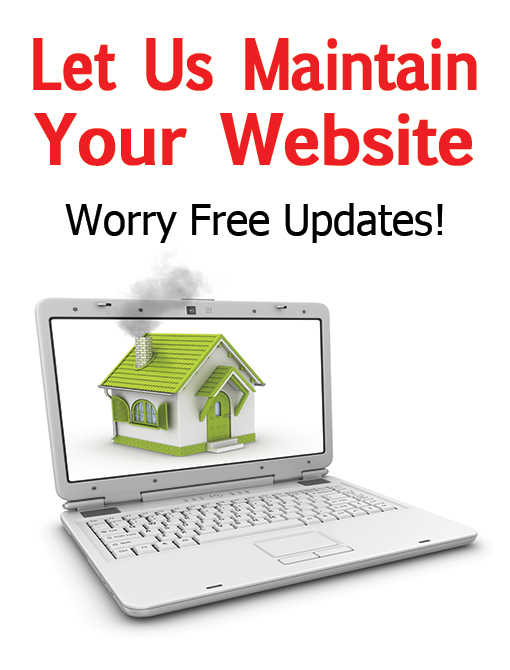 Just like your cell phone, websites need software and security updates on a regular basis. Our plans are the best way to keep your website up to date and as secure as humanly possible against the malicious threats that continue to undermine online trust and compromise today’s websites. Simply pick the monthly maintenance package that works for you. Going with one of our premium plans? They have their advantages, such as whenever you want something changed or added to your website, you simply email us the content and we do the updates for you! It’s that easy! When are the updates made? Most updates are completed within 48 hrs of receiving content changes, often within the same day. The sooner we get it, the sooner it’s done! Larger updates may take slightly longer. Please note submissions must be received no later than 3 business days before promotional deadlines. Please Note: Maintenance is limited to bi-annual core, theme and plugin updates. Any changes to content is subject to additional fees. This plan must be pre-paid annually. SSL (Secure Socket Layer) HTTPS designation This link ensures that all data passed between the web server and browsers remain private and integral. Bi-Weekly Security Scans with Firewall and Alerts Having a Firewall stops your website from getting hacked by identifying malicious traffic, blocking attackers, brute force attacks, viruses and new and emerging threats. SEO (Search Engine Optimization) SEO optimized images and content for faster search engine recognition and higher rankings. **1 update/month to existing content only. Does not include the adding of new content, forms, products, pages or posts, additional fees apply. Additional Updating Services ***2 updates/month includes the updating of new and/or existing content and products. Additional Updating Services ***4 updates/month includes the updating of new and/or existing content and products. *12 month contract. Annual fees must be paid in full. Monthly hours do NOT rollover, any overtures will be billed as piecework.